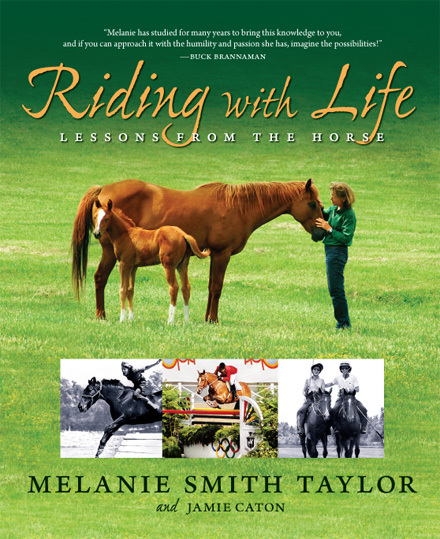 The Germantown Charity Horse Show (GCHS) proudly announces that Melanie Smith Taylor is taking preorders for her new book, Riding with Life: Lessons from the Horse, at the 66th annual horse show June 3-7, 2014. The GCHS is the first organization to offer signed copies of the book to the public. Riding with Life is scheduled for release in mid-July 2014. Melanie’s book captures the spirit and wisdom of a great horsewoman. It documents and connects the lessons she has learned from the greatest horsemen in her life. In this comprehensive training guide, she shares her unique program for setting horse and rider up for success. Blending her in-depth knowledge of groundwork and flatwork with her vast experience in the hunter/jumper disciplines, she explains how to achieve a harmonious partnership with your horse and realize his full potential—whether you’re a weekend trail rider or serious competitor. Against the backdrop of her life story, Melanie presents a wealth of detailed exercises, instructional photographs, and valuable advice, as well as details about the many horses that have helped shape her approach. 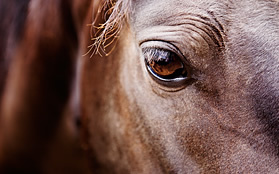 Throughout, she encourages us to appreciate and honor the nobility of the horse and forge a true connection with this wonderful animal. Melanie attributes a lot of the horsemanship skills she has learned to her mother, Rachel Smith, and to her beloved late husband Lee Taylor. “They were my biggest influences,” she said. “My mother, a great horsewoman, was my first teacher. Lee retired the year we married, in 1989, and we spent twenty-four/seven together riding, working with, and caring for over 100 horses on the farm [Wildwood Farm in Germantown, TN]. Lee introduced me to the great horsemen, Ray Hunt, Buck Brannaman and Mindy Bower, who came to Wildwood. And, of course, George Morris was my mentor in the show world. “Lee treated horses they way he treated people. He was never judgmental and he gave every horse a chance to be their best. He appreciated all horses, believing that all horses are innately good. He contended it is the humans in their lives who taint them. He didn’t expect every horse to be of equal ability, but he appreciated every horse as special, regardless of bloodlines, physical beauty, or show record. I really respected that about Lee. He made me think about horses differently. “We had horses of all ages, so we worked with different approaches and spent a lot of time on ground work. 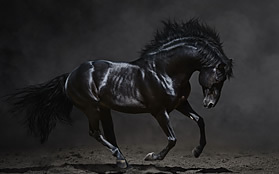 I learned how the horse thinks and the importance of thinking like a horse and connecting with the horse through feel. I learned the importance of working with horses from the time they are born and using proper groundwork at every stage of their development. “The book includes lots of details on basic exercises for the horse. There are ground work, flat work, gymnastic, and jumping exercises. It’s a well-rounded book. “The main point of the book is feel and connection with your horse,” Melanie summarized. Melanie grew up in Germantown, TN where she competed in horse shows throughout her childhood. The GCHS was her very first show in the early 1950s, where she and sister, Sunde, won the blue ribbon in the costume class, now named after her mother: the Rachael Smith Memorial Costume Class. Melanie trained with George Morris in the early 1970s, and was successful in amateur-owner jumper classes before graduating to the Grand Prix level. In 1978, she earned the American Grand Prix Association’s (AGA) Lady Rider of the Year title, as well as the AGA’s overall Rider of the Year, and her mount Val de Loire was named AGA Horse of the Year. In the late 1970s and early 1980s, she teamed with Calypso, and the pair became famous worldwide. Melanie was one of only two riders ever to win the “Triple Crown of Show Jumping:” winning the American Invitational, the International Jumping Derby and the American Gold Cup; she was the only person to win all three on the same horse, Calypso. Melanie rode on the USET’s Gold Medal team at the 1979 Pan American Games in Puerto Rico. At the “Alternate Olympics” in 1980, she won the individual Bronze Medal aboard Calypso. She placed second that year in the World Cup Final. She was named the United States Olympic Committee Sportswoman of the Year after winning the World Cup Final in 1982, and was also inducted into the Tennessee Sports Hall of Fame that year. Riding Calypso, she capped her show jumping career with a team Gold Medal in the Los Angeles Olympic Games in 1984, the year she was a finalist for the Sullivan Award, given to the nation’s top amateur athlete. After retiring from active competition, Melanie continues to pass along good horsemanship principles. She has coached the Developing Rider Tours and was honored as the 2007 Developmental Coach of the Year by the U.S. Equestrian Team. 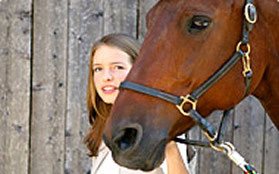 In 2009 she helped develop the Emerging Athlete Program (EAP) with the US Hunter Jumper Association. Currently, she offers TaylorMade Horsemanship clinics.